Albinism in hummingbirds is caused by a rare genetic change that either prevents or reduces the formation of dark-colored pigment in feathers. 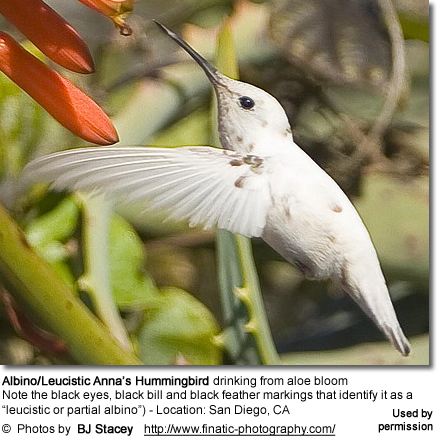 White hummers are extremely rare -- less than a hundred sightings have been reported in the Americas; most of which involves "partial albinos" or "leucistics" and only a small percentage of the sightings involved "true albinos." Should you be so lucky to see a white hummingbird, get your camera out immediately and take as many pictures (or movies) as you can. Record any details about this bird (where seen, physical description and anything else that you find of interest). Please contact your local authorities for their records and we would appreciate your e-mailing us the info / photos as well (e-mail: webmaster@beautyofbirds.com). This genetically recessive characteristic only shows up when a bird inherits the albino gene from BOTH parents. When only one parent carries this gene, the resulting young will be normal-colored, but will be genetically "split" to this genetic trait. Should these mate with either an albino or an albino-split, a certain percentage of white young / splits will result, even though the parents themselves may not visual albinos. 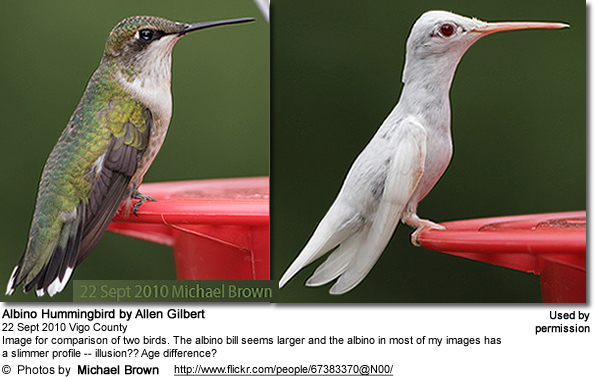 Leucistic / Partial White Hummingbirds: The more common form of albinism. Local areas of the hummingbird's body, such as certain feathers, are lacking the pigment melanin. The color of the plumage may range from pure white, buffy, tan or greyish. 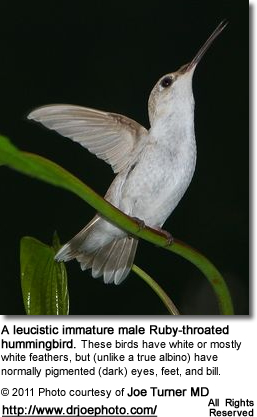 Like normal-colored hummingbirds, leucistic forms have black eyes, legs and bills. 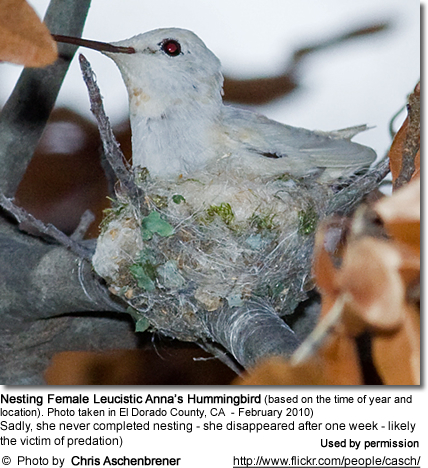 Leucistic Hummingbird Photos. pied, an absence of melanin in some feathers creating white patches. True Albino hummingbirds lacking any pigment in the skin, eyes and feathers. They have an all-white plumage. The eyes are pink or red; and the legs and feet appear whitish or pink due to the absence of black pigment, which allows red hemoglobin to show through. Under close inspection of an albino hummingbird, it was noted that the claws and the skin of the toes appeared transparent, so much so that the blood vessels underneath the skin could be seen. Imperfect Albinism: Pigment is PARTIALLY inhibited in the skin, eyes or feathers, but pigment is not totally inhibited in any of them. Incomplete Albinism: Pigment is COMPLETELY absent from the skin, eyes or feathers (but not all three). 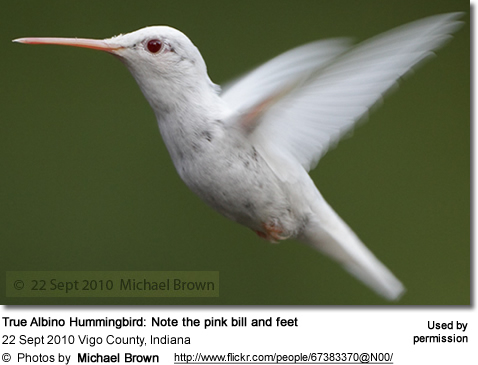 States / Areas Albino Hummingbirds have been reported in - sorted by location and dates. Subspecies listed if known. 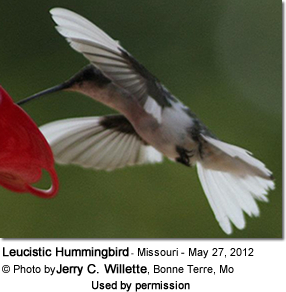 Migratory hummingbirds tend to return to their favorite hummingbird feeders or flower patches year-after-year. However, it has been noted that this hasn't been the case with albinos (true or partial) - none of which have been seen again at their previously favored feeding sites. All forms of albinism are associated with vision and potentially hearing problems and albinos are, therefore, less likely to detect predators early enough to escape. 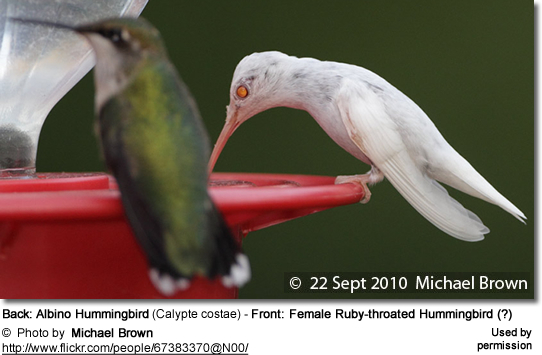 Predators, on the other hand, are able to see albino hummingbirds far easier than the more camouflaged normal-colored hummingbirds. Even more so at night when hummingbirds go into a state of torpor (temporary or semi-hibernation). 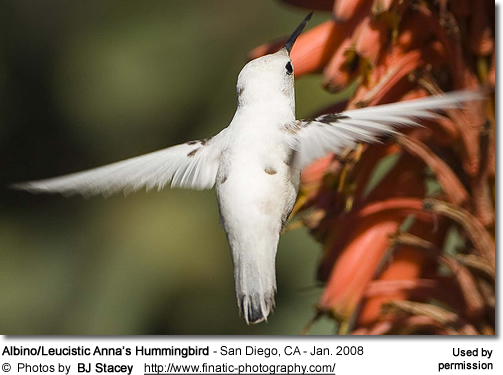 Please refer to: Hummingbirds: Interesting Facts. At this time, their white plumage is easily seen in the dark, and the albino hummingbirds are completely helpless. 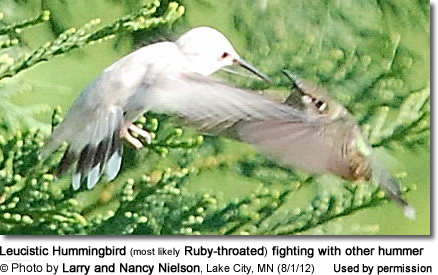 It was observed that the albino hummingbirds are more aggressively pursued / chased by their normal-colored counterparts. One theory is that albinos may carry a genetic defect that make them more susceptible to disease. The counter argument is that lack of pigmentation has nothing to do with immune function; nor have any physical deficiencies / abnormalities ever been associated with albinism, as known. 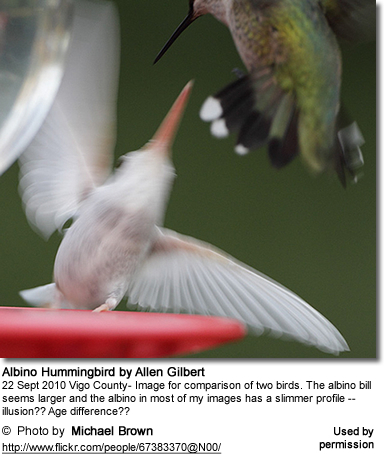 Albino hummingbirds have more brittle (weaker) feathers that wear out more quickly than those of their "normal-colored" hummingbird counterparts resulting in reduced flying ability that makes migration back to their former territories difficult or impossible. Albino hummingbirds may be less likely to attract mates .. The albino genetic trait may also be so rare because albinos may be less attractive to the other gender, making finding partners to mate with more difficult (but not impossible).